Baglietto has launched its first 46 metre displacement-hull superyacht at its shipyard in La Spezia, Italy. The Baglietto 46m displacement superyacht is the first to be launched in the Italian builder's new displacement yacht line, which will range from 43 to 54 metres, currently in build at the yard. Exterior and interior design of the comes from Francesco Paszkowski, who has given her exterior elements of traditional Baglietto styling. Interiors were also coordinated with architect Margherita Casprini. The interior motif is a combination of minimalist design and nature, combining light and dark colours and creating a sophisticated atmosphere. Notably, she has a spacious 25 square metre beach club, while at the opposite end her bow area is home to a 5.5 metre tender as well as a rescue boat. The first Baglietto 46m displacement superyacht will make her debut at the Cannes boat show and also be on display at the Monaco Yacht Show. Baglietto will also use the boat shows to introduce new designs by Paszkowski for Baglietto, representing the new core business of the shipyard. 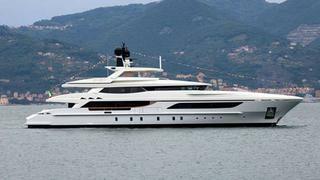 These include three planing-hull motor yachts – a 46 metre, a 43 metre currently in build and a new 35 metre as well as two displacement hull motor yachts, one 55 metres and one 62 metres. Baglietto recently received an order for the second hull in the 46m displacement series, sister to the yacht launched today, and also for a new 54 metre superyacht.